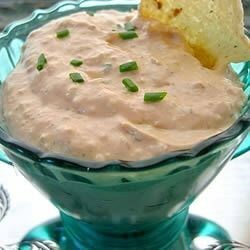 "Serve this creamy cheese and crab spread on crackers, or use it as a dip for breadsticks and veggies. You can also use shrimp instead of the crab. " In a medium bowl, blend the cream cheese, lemon juice and hot pepper sauce. Stir in the green onions and crabmeat. Chill in the refrigerator at least 1 hour before serving. When ready to serve, top with cocktail sauce. Great combination - I did plus up the tabasco sauce though to 1 Tablespoon and used the green tabasco sauce instead. Way too much cocktail sause, it completely over powers the flavor of anything else. Not enough crab. Will not make again.